With the wing in its temporary position attached to the cabin, construct the aileron on the workbench holding all components together with clecos. Clamp the aileron into position on the wing to make sure there is correct clearance at each end. 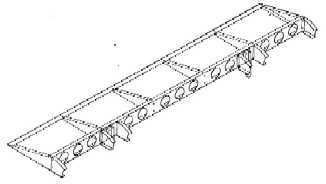 I am going to use 6 solid rivets instead of bolts to secure the brackets to the aileron itself and will not have to insert and inspection plate, but bolts for the support arm as these can be checked externally. TIP: Don't drill the holes in the support arms until both the wing and the aileron has had their skins riveted into position, this will help in the correct alignment of the aileron with the wing. 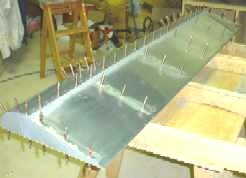 Considerable time needs to ne allocated for cutting and riveting the skins to the aileron to make sure it fits with a 10mm gap on each side within the wing and able to move up and down without being affected by the support bracket. TIP: Continually check the aileron with the wing for shape, gaps and movement. When riveting, start in the centre and work out evenly both sides to make sure the trailing edge remains straight otherwise it will not line-up with the trailing edge of the wing. Perfect fit with even gaps on both edges and full movement. 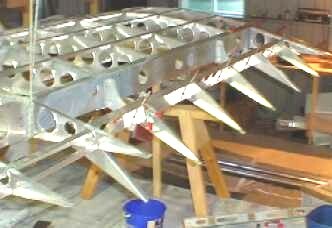 TIP: Holes have not yet been drilled in the support brackets until the whole wing has been skinned. This will enable the height and the trailing edges to be aligned with a string line before the holes are drilled and the bolts inserted. 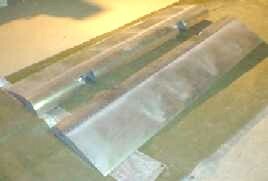 Both ailerons are now completed and ready for their final assembly when the wings are attached to the fuselage. At the time the mounting holes will be drilled making sure all surfaces are aligned and the the control rod that joins the aileron to the control mounting bracket will be cut to length. Before that happems thought, I will spray the alierons with undercoat in preparation for its final coat of paint.